I’ve been really loving the past few weekends. Taking it easy, going to brunch, not freezing as soon as you walk outside… ALL GOOD THINGS. I wore this particular look to brunch at Cindy’s (more on that coming to LSL this week!) with a bunch of my blogger pals. I knew some of us would shoot for each other after, so I decided to try something a little different. 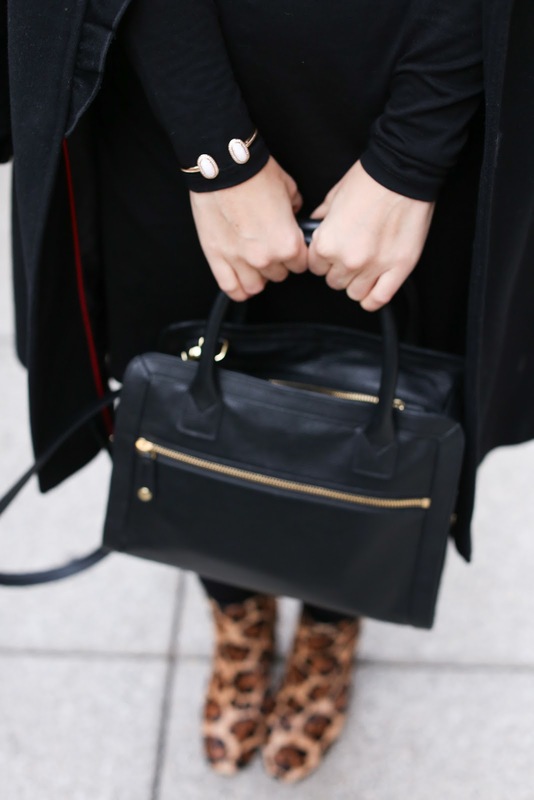 I rarely wear all black – I love color and feminine details and feeling flirty, so black always feels super serious. Luckily, I had some leopard booties to counter the turtleneck dress, black tights and black jacket. Gotta add some fun in there somewhere, right?! I felt like a blob without any waist definition, so I was thrilled when I rediscovered this wrap belt. I used to be obsessssed with this thing, so watch out. You might be seeing a lot more of it. It’s so cool though – so many different ways to tie it!! There’s nothing like Chicago on a beautiful day. These 40 degree weekends have gotten me SO excited for spring and summer!! Big thanks to Maya from Charmingly Styled for these photos! Every time you wear those booties I swoon! Such a chic NYC look Lauren! So cute Laurent! I'm with Ashley and soon every time you wear those booties, they are so cute!! Hope you are doing well girl! Wow! You look stunning! I recently purchased a similar pair of sunglasses brought from online store and you gave me the perfect style inspiration on the kind of bottoms I should wear it with! Thank you for sharing this awesome post!